I found this tip recently as I was trying to figure out which Chrome tabs, of the many I had open, were causing my work (which I often do on the Internet) to slow down. I tend to avoid rebooting my computer for various reasons, which I won’t go into here. That may temporarily fix the problem addressed here, but at the expense of causing other issues that have a higher time cost to me. Read this article by Nancy Messieh and then skip to the end of this post. Side note: I find it ironic* that when I open that article on a new tab, it immediately jumps to the top of the list of Memory Hogs. which isn’t extremely helpful, other than narrowing down the problem to whether Chrome is the culprit or not. But, Chrome has its own Task Manager. And it gives us the details we need, which is something identifying the tab. A few things struck me when I first opened this Task Manager. The first was how much memory some of the tabs were taking. A few of them were taking up 90% of the resources that Chrome overall was consuming. The image above is AFTER cleanup. When I first saw this, several Smartsheet tabs were over 400Mb of memory, and Gmail was too. The second was related to Smartsheet — and how each tab was consuming different resources, even when the same number of objects are open in Smartsheet and the same Sheet/Report is being shown. I’ll come back to that. Sorting this list by Memory will show the Memory Hogs. First, one by one starting at the top, I grabbed the URL’s of all the tabs taking up more than 100Mb. If it was something I hadn’t finished (like a long The Atlantic** article), I’d determine if I would, ever, finish it or not and then close it. That was easy. Second, after some experimentation, I noticed that when I closed Gmail and immediately*** reopened it, the memory usage dropped by half. Half. After watching this for a few days, Gmail’s memory usage has slowly increased, but has not reached half of the original difference yet. I’m not completely clear on what is going on behind the scenes, so some of this is just guesswork on my part. Using what I learned about Gmail, I closed one of the Smartsheet tabs and waited about ten seconds (not immediately***), and then reopened Smartsheet. While watching the Chrome Task Manager, waiting until the CPU activity for the tab dies down is probably a reasonable wait period. The tab’s memory usage dropped. Repeated experiments with the same tab also dropped on the second reload, but not much after that. As the amount of memory being consumed decreases, there is some level (most are somewhere between 50Mb – 80Mb) where the system is what I will call “base load”. At this point, I cleaned up about 30% of my memory usage from Chrome and in the past week or so have not noticed anything really bogging down my Internet connection. Just closing and reopening Smartsheet (and Gmail) was enough to see noticeable improvement in speed. When Smartsheet is closed, whatever objects (Sheets, Reports, etc…) that were open are remembered. After that ten second lag (or so), reopening the Smartsheet App should open all of the same objects in use before it was closed. Last close “wins”. What this means is I can (and do) have several “views” of Smartsheet — tab 1 has ten sheets open, tab 2 has eight sheets open, tab 3 has thirty sheets open (don’t judge me). I can run through each, close and reopen them to keep my “views” same, but result in less memory being used. As Smartsheet (and Gmail) are used and time goes by, the memory usage slowly climbs. The rate is somewhere between grass growing and noticeable in a minute or less. This occurs for other tabs too and also when the tab is not the active one. Activity in those tabs (by the user) causes those to generally increase. I say generally because usage may go up or down over a short period, but overall the trend is increasing. This trend is not continuous, nor linear. Further, two tabs in Smartsheet open with the same objects will start from different base loads and their trends will be different, but similar. 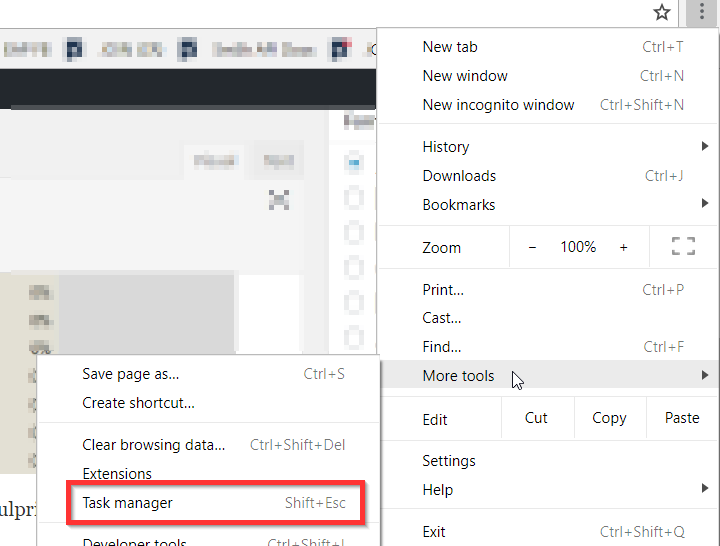 Within a single Smartsheet Chrome tab, switching back and forth between two or more Smartsheet objects (without any other interaction with the Sheets or Reports) will cause the memory usage to trend higher. Some Smartsheet objects seem to have more of an impact, but I have found no direct correlation to the Sheet’s complexity or size, at least not a definitive one (yet). My assumption is there is a correlation. I was hoping to use this information to check for memory hogs before releasing a Sheet to a customer, but so far, nothing definitive. Switching between open Smartsheet objects in the same Chrome tab also has an impact (some increases, some decreases). If I had more time, I’d make some pretty charts and graphs, because everyone loves those, right? But I’m starting to beat a dead horse !**. To recover some memory in your system, close and reopen Smartsheet. 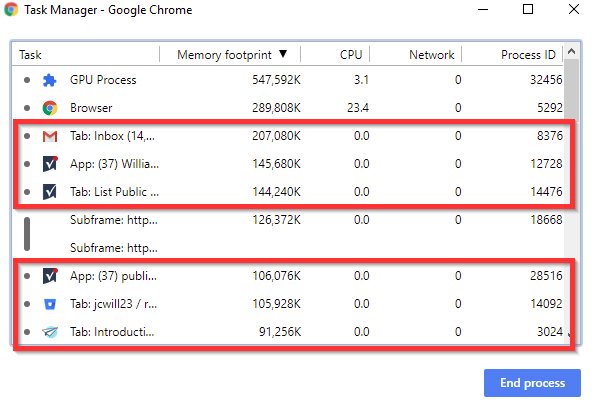 If you want to dig further, use the Chrome Task Manager to pinpoint the most obnoxious memory hogs. I assume this will work with other browsers, but haven’t bothered to prove it to myself. If you like this post, please “Like” it. People don’t tend to do that, but it hasn’t discouraged me yet. If you have questions about this post, please add them below. If you have questions about something else in Smartsheet, post on the Community. I occasionally stop by to answer them and so do a lot of other talented people. I have a Smarthsheet tab open with about a dozen Sheets. It was one of the three or four Sheets on which I was focused. Memory footprint had risen to about 400Mb over the last day or so. I enabled a formula to check for duplicates =IF(COUNTIF(Node:Node, Node@row) > 1, 1)) to about 2400 cells. Memory usage jumped to over 1500Mb and then settled just above 1Mb. After I was finished checking for duplicates, I removed the formula. Memory usage dropped to 800-850Mb. I closed and reopened the sheet. Memory usage is about 130Mb. I don’t know if I can get into the habit of closing and reopening Smartsheet after each ‘large’ change — and I’m not sure how to quantify ‘large’ with any degree of accuracy. For now, Chrome’s Task Manager is taking up some real estate on my third monitor. *Really ironic, not like that horrible song from what’s her name that set English teachers back weeks trying to teach Shakespeare’s use of irony. **I’m implying The Atlantic is my main source of news, or that news might have dominated the list of hogs, or even that my open tabs are somehow “useful”. Did I fool anyone? ***For Gmail, I said “immediately”, but superstitious behavior leads me to wait a few seconds, more than two, less than ten, before reopening it. I don’t know if that helps or not. For Smartsheet, I ALWAYS wait 10 seconds as I have opened Smartsheet again after waiting less and the open tabs were different than I expected.
! * An example of why it takes me so long to write these posts.
! ** I can’t think of reason why I would do that.